I remember back in January foreseeing a long and busy beginning of the year. I got myself organized with my life, my blog (which is my life too! ), my work, my classes and I got into a zen attitude to face what I knew was going to be a hard month. It is now March and the expected slow-down pace did not happen. Actually, things just got more busy, hectic and chaotic. The problem is that the big work load I had in January was supposed to be relieved by a teacher finally coming back from a long leave. Not only did that teacher not come back (and she won’t at least until the beginning of next school year) but another teacher is about to go on maternity leave. So what happened? My scheduled got changed for, I believe, the 15th time this year. I was “asked” (not that I could say no!) to leave the two classes I was working in and take full charge of the 3-4-year old kids class. I am now transitioning into that class by working 2 days in the old one and 3 days in the new one. From April I will be fully in charge. Now, I adore this class. I love the kids of the class. I know them pretty well. But suddenly becoming the head teacher (never been a head teacher before!) and in April (after the class has been with another teacher for 7 months) is not only very hard but scares the hell out of me. Without considering that, despite asking to work about 20 hours per week this year, I will now be working 35-40 hours. Needless to say, I freaked out! After the news, for an entire week I was not even able to sleep for how anxious I was. Yes, I know, as Wally says “You’ll be fine. Actually, Amore, you will be great!”. Possibly. But that doesn’t change the fact that I am anxious and exhausted. Last week was my first transition week and in an attempt to reschedule several life events around the new schedule I even had to cancel my baking session with Carla. This week I did not want to let that happen. I will still be baking with Carla, despite my physical and mental exhaustion. I am just very sad because I realize how absent I am from the blogging world lately. If I am not visiting your blog very often, my friends, please bear with me! I did not forget you. I just can’t find the time to do anything in my life in this moment. I can barely bake and post, let aside visiting all the wonderful blogs you all work so hard to keep. I am keeping track of all that happens to you though and you are in my thoughts. Preheat the oven to 325F degrees and prepare a tartlettes pan (or ramekins). In a large bowl, mix the butter and sugar until creamy. Add the almond extract and the egg and mix it well. Finally, beat in the flour until it's well incorporated. The dough will look pretty thick and sticky. Divide the dough among tartlettes molds (or the ramekins), pressing it evenly into the forms with your fingers. 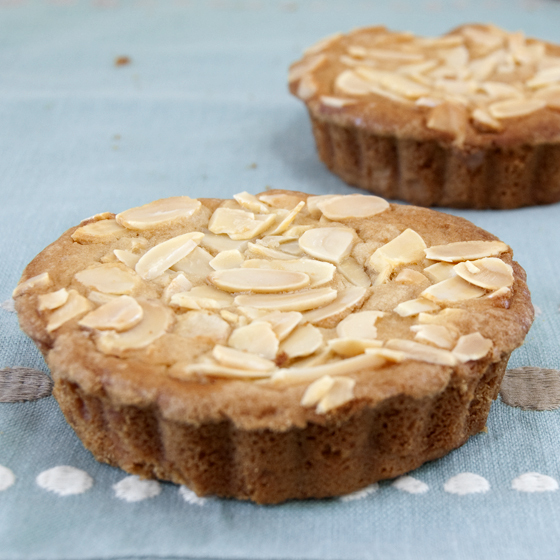 Sprinkle a layer of almonds over each tartelette and press them down lightly. Whisk together the egg white and water and brush the mixture over the almond layer with a pastry brush. Bake for about 20-30 minutes, or until the edges are of a light brown color. Place the tartlette pan on a cooling rack and let them cool before trying to unmold them. Very cut cakes! They sound great. I'm sure you will do great with the new class, but I can understand your stress. Just relax whenever you can, things will get better! Life sometimes gets in the way of blogging. Kudos to you on keeping your baking date with Carla. 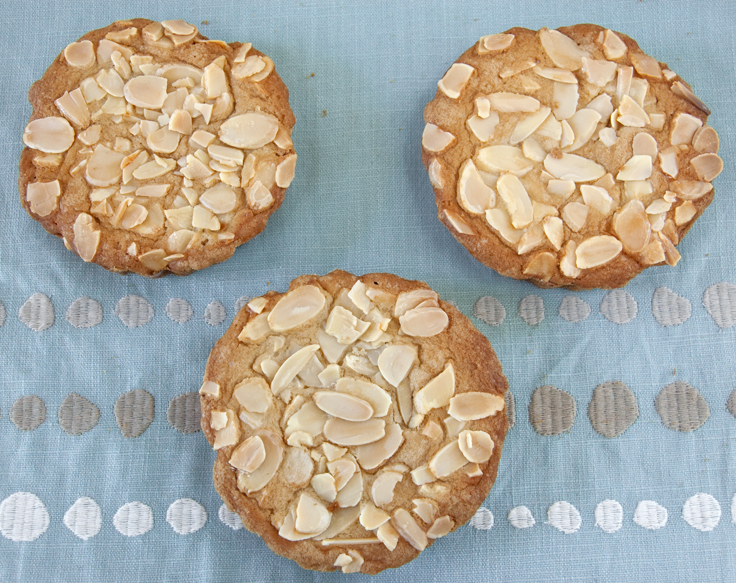 Great little Almond cakes and pics. Gorgeous cakes. I'm so happy that you were able to cook with Carla today and will continue to do so even though your schedule is horrendous. I miss you a ton but would rather you focus on what's necessary (your health, your hubby, your kids) and get back to us when things lighten up. When that happens, you come visit North Carolina so I can pamper the heck out of you! life changes are stressful but I'm pretty sure you're a strong woman and you'll face them with courage. Every thing will work out just fine, try and relax Sara. these little almond cakes are so pretty, and i bet as tasty as they look. I agree with your hubby--I know you'll be great. I'm just sorry that you'll be so busy. I hope you don't let yourself get too worn out. That said, I already know I'll love these cakes. You had me at almonds. They're gorgeous, too! They look lovely, gorgeous pictures. Aw honey, you are so busy and it's tough. I understand and I love your blog whether you are posting every day or once a month. I promise I will continue to stop by! And I love these little cakes you did with Carla, they look delicious! I'm sorry things are so crazy. I'm glad you made some "me" time! I have to admit though, when I really evaluate life, I'm much happier being busy. Don't you think? Your little almond cakes look wonderful and I bet they were extremely tasty too! These sound so yummy good! And they're so cute! What all the other gals said. I have long ago given up on trying to keep up with the other blogs. I blog when I can otherwise it would be too stressful and no one need more stress. We can all do with more cakes like these though to make life sweeter. The cakes look wonderful. It looks so fluffy. OMG - I adore almond! In a cake now that is divine! These are a must make. Have a wonderful week! I'm so glad you were able to fit time in with Carla, I'm sure she looks forward to it. I hear you on waiting for things to slow down. Don't worry about keeping up, everyone is busy. Love almonds, will put these on my must try list too. Have a great rest of the week. I love your almond cakes..they are perfection! sometimes I wish that I have 48h, and still would not be enough to get everything done! Hope you will find your way and rest a bit! These almond cakes are making me very hungry, and I just had lunch! Congratulations on the head teacher job! A friend of mine from high school did something very similar and is now 20 years as the head teacher and love it. Love these little almond cakes, I'm all about the individual dessert now and these would fit right in. Now worries about comments... I am having a difficult time commenting as well. Life just gets in the way. Know that we are thinking of you too! Can't wait to hear how the job progresses, hang in there! I know you will be a wonderful head teacher. I luv these little almond cakes! The size, presentation and the fact that it's made up of almonds. I wonder how much the texture would change if I used almond flour? Just a thought. Oh Sara it sounds like you need a little relief and some time off from work! I feel for you because I understand how work can be overwhelming and squelch your passion and time for other things. :( But, you still managed to make some AMAZING almond cakes, and of course, any recipe from Lindsey is great! Sending you hugs and hoping your schedule improves so you can have some time to relax! How cute are those little almond cakes?! They look just perfect and so good. I absolutely love almond desserts. :) Congrats on becoming a head teacher! What a lovely little treat. These look amazing. Sara, I totally understand where you're coming from. And way to hang in there! So good to see you posting...we all have those overwhelming times. You just keep doing your best...we can't be 100% with everything. These lovely cakes look fabulous...mmmmmm. These look like the perfect escape from overwhelming schedules :) I've been feeling the same way too lately between working and coaching (another one of those how do you say no to things in my life...) and I am ready to sneak off with one of these little cakes to the back patio and ignore the world for a bit :) Hope they brought you peace! What cute little sweets! Baking always helps sooth me during rough moments in life. Sounds like things are getting pretty crazy in your neck of the woods, Sara! What great news about the head teacher job, though! Congratulations! These cakes look delightful, and I'm sure Carla loved them!